The Celebration of Christ the King means that there is an authority above worldly ones, and that it looks just like Jesus. Earthly leaders all have feet of clay, and Christians should have modest expectations in that regard. But we are called each day for service to one whose reign is the reversal of all the sorry abuses of power that we can lay at the feet of humanity. We are called in hope, to receive the kingdom that is not of this world, but that is present in this world. "...He is here styled a prince: but by and by he hears his title of king; yea, King of kings, and Lord of lords." This phrase, the kings of the earth, signifies their power and multitude, and also the nature of their kingdom. It became the Divine Majesty to call them kings with a limitation; especially in this manifesto from his heavenly kingdom; for no creature, much less a sinful man, can bear the title of king in an absolute sense before the eyes of God." 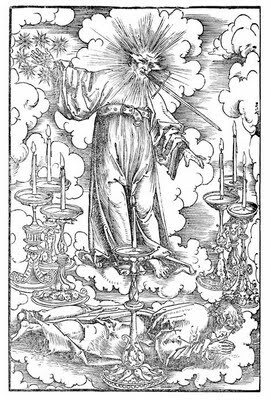 Image: One Like a Son of Man, based on Revelation 1. 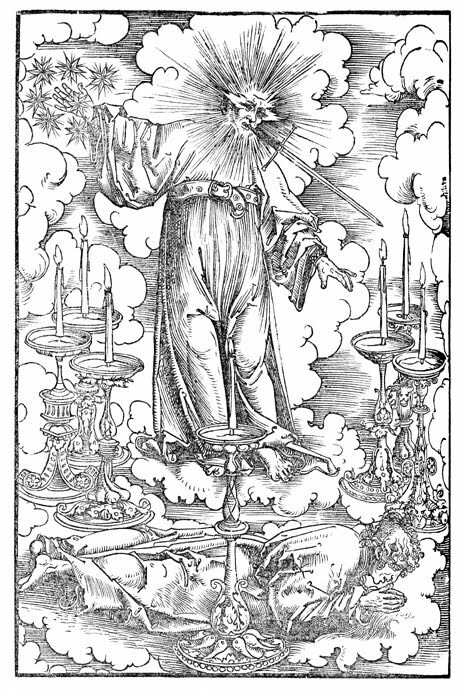 Woodcut by Lukas Cranach the Elder for Martin Luther's translation of the New Testament. Courtesy of the Digital Image Archive, Pitts Theology Library, Candler School of Theology, Emory University.